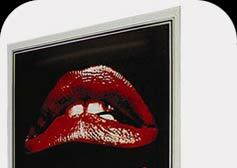 CDA Entertainment have now released The Rocky Horror Picture Show classic Collection Box Set. The set was released on 4th October 2004 and includes the two disc DVD quote "(with great added value extras), 8 reproductions of the original motion picture US lobby cards, a full colour Commemorative Booklet, a set of 6 Black and White Press Stills, a collectible film Senitype® (image from the film and 35mm film frame) and a reproduction of the original US cinema poster (27" x 40" - one sheet) in-pack offer". The movie discs are exactly the same as the 25th Anniversary DVD release, even the enclosed booklet is the same version (complete with TimeWarp fan club address on the back page). However the extras are the items of real interest with both (USA) 8 lobby cards and 6 Black and White Press Stills included in the package as well as an actual frame of the movie. We were looking forward to checking out the bonus disc from CDA as the packaging and promos advertised it as quote "Exlusive bonus materials, discounts, games and prizes", however on our copy gets you just some information on other CDA titles and a link to the CDA website with some discount offers on their other movie titles. There is no actual bonus Rocky information whatsoever, we think they've missed a great opportunity there, even if they had only included some more stills and a shooting script on the bonus disc. When we tried registering to see if there was any extra bonus information on their site we found nothing Rocky related, we did find a programmers message when we tried the competition part of the site, hopefully that is now fixed. The Senitype® is a nice idea, Fox were planning something similar when they first released the discs here in the UK (we know as we have some of the sample frames) and this makes a nice collectors item. The Press Stills and the Lobby Cards are also quite a nice collectors item, although they are quite small (to fit into the packaging). Their size is only 13 x 15 cm about 5" x 6"m, they are also USA releases rather than the UK Lobby Cards. The Free Poster is a mail away offer, which costs the p&p only (£3.99), again this is a USA release poster rather than a UK one. The box itself is very nicely presented. Overall we would recommend this as a collectors item, if you just wish to watch the movie buy the normal two disc version (at time of writing Saturday, October 23rd, 2004 we've seen the two disc on sale for less than a tenner). CDA Entertainment is proud to announce the upcoming release of THE ROCKY HORROR PICTURE SHOW classIC COLLECTION box set on 27th September 2004. Starring the gender-bending Tim Curry (Dr. Frank-N-Furter), Susan Sarandon (Janet Weiss), Barry Bostwick (Brad Majors), and Meatloaf (Eddie), you can now own more than just the fabulous film as your home can become a theatre of super-charged sensuality and outrageous fantasy! Having maintained its position as a midnight movie favourite, the Rocky Horror Picture Show is hugely popular with both 'virgins' and 'experienced' audiences alike. 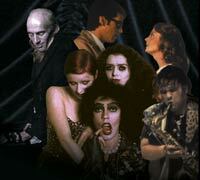 Re-live Richard O'Brien's sinfully twisted homage to horror, sci-fi, B-movies and rock music. This cult phenomenon of cosmic pleasures will have you dancing for years to come! 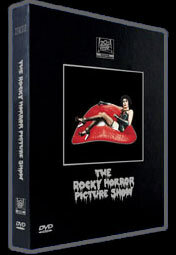 THE ROCKY HORROR PICTURE SHOW classIC COLLECTION box set will include the two disc DVD (with great added value extras), 8 reproductions of the original motion picture US lobby cards, a full colour Commemorative Booklet, a set of 6 Black and White Press Stills, a collectible film Senitype® (image from the film and 35mm film frame) and a reproduction of the original US cinema poster (27" x 40" - one sheet) in-pack offer. Sing-A-Long: "Toucha Toucha Touch Me" and "Sweet Transvestite"
Running Time: 96 minutes approx. Well there is just the same Easter Egg that appeared in the previous two disc version of RHPS, as this box set uses that version for the movie. So did you win a copy of this great new Box Set? TimeWarp got together with those very nice people at CDA to give away two copies of this great new release. Two lucky winners each received one of the first copies to be produced, a real collectors item. The winners were Sharon Hughes, Birmingham, UK and Neil Molyneux, Bootle, UK . We had well over five hundred entries to this competition, so very well done to our two lucky winners.